DAY 1: ARRIVAL SRINAGAR - SHIKARA RIDE:- Srinagar Airport pickup and transfer to Houseboat. Afternoon Boat Shikara ride over the Lakes including visit to Floating Gardens, Vegetable Gardens and Islands. , Overnight stay at Houseboat. DAY 2: SRINAGAR - MUGHAL GARDENS:- Visit famous Mughal Gardens (Nishat, Shalimar Cheshma Shahi) & Shankaracharaya Temple) & Old and New Srinagar city, overnight stay at Houseboat. DAY 3: SRINAGAR - GULMARG - SRINAGAR:- Day trip to Gulmarg. 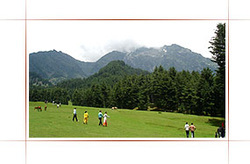 Full day at leisure to take the leisurely walks on the lush green meadows of flowers with a backdrop of the snow-capped mountains. Enjoy pony ride or Gondola ride (rope way) to Khillanmarg at your own cost, evening back to Srinagar at Houseboat. DAY 4: SRINAGAR - SONMARG - SRINAGAR:- After breakfast full day excursion of Sonamarg. You may take a pony ride (at your own cost) to Thajiwas Glacier where snow remains round the year. Return to the Houseboat by the evening for overnight stay. DAY 5: SRINAGAR AIRPORT DROP:- After breakfast Stringer Airport Drop for your onward flight back home.